Dont buy Foam Filled hot tubs WHY? 1. Access – As you can see from the picture above, one of the downsides to foam filling is that all jets, manifolds and pipe work are submerged in foam. This makes any future maintenance or repair work very difficult and prolonged for the service engineer. 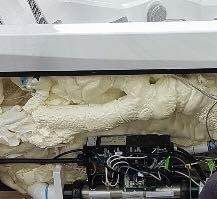 If say the tub is leaking from the light in the footwell of the tub, the service engineer will need to cut through 3 feet of foam to get to that part before he can repair it. Service engineers don’t like cutting blind into foam as they might disturb and puncture pipes etc by when doing so. It also means that the engineer will take much longer to fix these kind of problems which will cost you more money when the tub is out of warranty. Can you imagine turning up to a car garage and buying the car model with the welded shut bonnet? You would always ask “how would we do maintenance and repairs if we cant get to the engine and equipment?” It doesn’t make sense!!! 2. Heat Transfer – For many years we have used warm air in wall cavities in our houses for insulation. As we all know heat rises so why not use the warm air under the cabinet of the hot tub and transfer it through the acrylic shell and into the water. This helps keep the water warm and protects all the hot tubs pumps, heater and plumbing from winter conditions. The heat is created from the pumps, heater and plumbing on the hot tub. If you create a barrier of foam you cant use it, most foam fillers will vent the hot air out of the cabinet which is a complete waste of energy.